Lazy Susan was founded in 2007 by business owner, Michael Scott, literally from his garden shed. After many years of trying, in vain, to maintain various teak and wood garden furniture sets it became clear to Michael that the longterm solution was in fact aluminium garden furniture. Maintenance free and totally rust proof garden furniture, almost too good to be true. No rust and no rot. After much searching, product testing and deliberation, Michael found a range that exactly fitted the bill and then launched Lazy Susan Furniture in March 2007. Since then, thousands of metal garden furniture sets have been successfully delivered, and our metal garden furniture range has greatly expanded. Michael's passion is to offer exceptional customer service and deliver a superior product at really great prices. After around 15 months the business success required Lazy Susan to leave the garden shed and move to larger premise. Sales grew from around 200 sets a year to 500 sets and then more than 1000 sets and 7,000 chairs in 2011. Lazy Susan exhibited at many Garden Shows in the first few years including Surrey County Show, RHS Malvern Spring Gardening Show, Suffolk County Show, Edenbridge and Oxted Show, Newbury Show, Stansted House Garden Show, Midland Game Fair, and Parham House Country Show. Our first website costed £1,000 and was launched in 2008, it was such a success that we upgraded to a new site in 2009. The requirement for further staff was evident. In 2009, the business doubled sales and continued on this trajectory into 2010. After completely filling two barns with stock, it became clear that a substantially larger warehouse was needed, and that it would make great sense to lease this space from a Transport Company. Due to that really wet summer in 2011 it became obvious that it was a little risky to wait for the British summer to arrive, so we launched a French website in July 2012. Business in France was quite good so we decided to try a site in Germany which went live in March 2103. Currently we have 5 European websites France, Germany, Holland, Spain and Italy and we also ship garden furniture on a regular basis to Belgium, Switzerland, Austria and Portugal. So, in 2011, Lazy Susan moved to Chichester, where we had over 8,000 sq ft permanent storage space and the facility to use an extra 10,000 sq ft during the peak season. The company is a modest, family business with a small, highly motivated and dedicated team of staff whose primary objective is to deliver outstanding customer service and a quality product at really competitive prices. We are also really proud of the large number of customer photos that have been sent to us in the past couple years and you can see some of these pictures all over our website. Please contact us however it is most convenient; by phone, or by email if you have any questions about our garden furniture sets or you would like to discuss delivery options, or have a chat about a special quote that you would like us to produce for you. 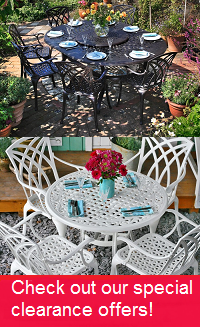 Cast aluminium garden furniture has so many benefits over teak garden furniture and cast iron garden furniture. 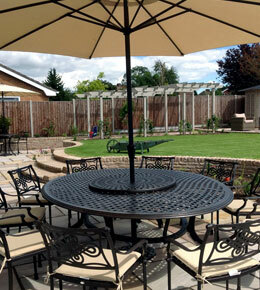 Aluminium garden furniture will not rot and will not rust. Long life guarantee - it will not need replacing every 3/5 years like wood, plastic and other materials. It is designed to be left outside all year. It is without doubt the best garden furniture that you can buy! Some customers like to sit in the chairs, see the tables and get a real feel for the furniture before purchasing. Showroom visits are by appointment only, and details can be found by clicking here. Highly recommend and customer service is excellent! Fast efficient service. Quick delivery and well packaged. We are really pleased with our purchase. Easy to assemble. Also ordered cushions and parasol with free delivery you cannot go wrong. Very competitively priced . Highly recommend and customer service is excellent should you need to use it. Many thanks!!! The delivery was very prompt and efficient. The table and chairs were well packaged. Very pleased with the quality and standard of the table and chairs and instructions very easy to follow. Quality and thought has been put into the fixings. Would recommend without hesitation .